Cactaceae (Backeberg) 2: 171. 1920 [9 Sep 1920] Backeb. Origin and Habitat: Arrojadoa penicillata occurs in southwestern Pernambuco, northern and eastern Bahia east of the Chapada Diamantina, and in the valley of Rio Jequitinhonha, in the northeastern part of Minas Gerais (Brazil). Altitude range: It grows at altitudes from 200 to 850 metres above sea level. Habitat and Ecology: The species can be found in granite/gneiss inselbergs or lajedos, sand dunes, and stony ground (rarely in limestone), where it grows under or through shrubs in the caatinga-agreste and caatinga-campo rupestre (dry brush and other thorny plants). This species is widespread and common throughout its range. The habitat of this plant is under degradation due to deforestation for logging, agriculture, cattle ranching, urbanization, quarrying, and due to fires. Succulenta (Netherlands) 59(1): 20 (1980). Description: Arrojadoa penicillata is a shrubby, much branched cactus, to 2 m high often supported by the surrounding vegetation or semi-scandent to decumbent (especially when growing in sand-dunes). The bright crimson flowers are produced at the growing tip of stems from the cephalium (a structure of wool and bristles at terminal ends of joints forming a thick ring around the stem), they measure 4 cm in length. The slender stems rarely exceed 10 mm in diameter except near the cephalium. There are about 10 low ribs with closely set areoles bearing short spreading spines. It is not easy to maintain, but very interesting to cultivate. Derivation of specific name: Latin penicillatus = shaped like a brush. Stems: Segmented, not very fleshy, olive-green, very slender, to 2(-4) m long, 1-1.8 cm in diameter, expanded to 2.5(-3.0) cm in diameter below the cephalia. Vascular cylinder very woody. Roots: Rootstock fibrous, not tuberous or rhizomatous. Areoles: Small (± 2 mm in diameter), close set, long hairs present but soon falling. Central spines: (1-)2-3(-4), reddish brown, stout, rigid, 4-30 mm long. Radial spines: (6-)8-10(-12), short (± 3-5 mm long), very fine, flattened against the surface. Cephalia: Apical produced following each season's vegetative growth, producing 3 or 4 ring-like clusters on the same axis of abundant white wool and long red to brown bristles to 20-30 mm long. Once flowering begins the flower buds will form from the cephalium. Flowers: In clusters of 6-12, opening during the day, bird pollinated, pinkish magenta or reddish pink, to 3 cm long and 2 cm in diameter. Pericarpel 7-8 mm long. Tube to 12 mm long and 4-7 mm across, cylindric, with fleshy bract-scales only at apex. Perianth-segments bright pink with a very fine darker line around the margin, outer segments to 7 mm long triangular to lanceolate, well-expanded, innermost segments remaining erect and forming a tube which encloses the stamens, its opening 3-4 mm in diameter. Stamens included within the perianth-segments. The filaments below the anthers are thin, like threads, while the lower stamens form a nectar chamber. Style 10 mm long, stigma-lobes 6-8, included. Fruits: Globose to obovate, sometimes laterally compressed, smooth, greenish to dull red, olive-brownish or whitish,12-25 cm long and about 12 mm in diameter. Seeds: About 1.2 mm dull black. 5) Machado, M., Braun, P., Taylor, N.P. & Zappi, D. 2013. Arrojadoa penicillata. The IUCN Red List of Threatened Species 2013: e.T151955A580661. http://dx.doi.org/10.2305/IUCN.UK.2013-1.RLTS.T151955A580661.en. Downloaded on 24 September 2016. Cultivation and Propagation: These tropical cacti are not the easiest things to grow and aren’t plants for beginners. With their snake-like growth they are ideal cactus for hanging baskets. Soils: It requires a rich but very porous mineral cactus mix soil. Light: They prefer very bright light, not as much as the most arid growing cacti, but plenty nonetheless. Tends to bronze in strong light, which encourages flowering and heavy spine production. Watering: They grow from April to October and cannot endure long stretches of total dryness, and also too much water will rot them, as their weak root systems tends to be inefficient at sucking up water from wet soil. Nonetheless, again as a result of their tropical origins, they need a fair amount of water, but allow the soil to dry quite a bit before watering again. Fertilization: Do not feed in winter. 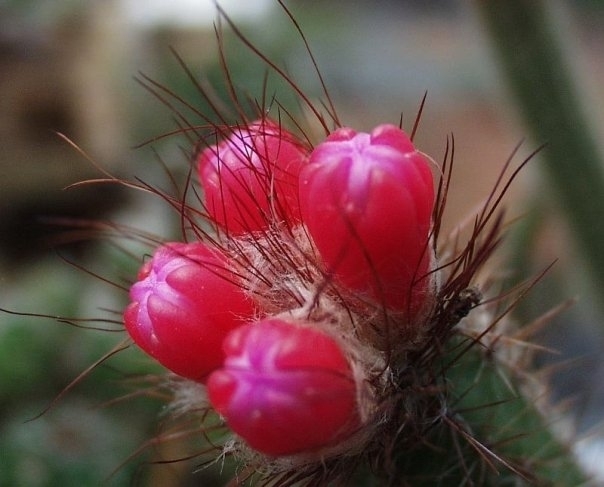 Hardiness: They rest from October to April but can’t stand cold, or even fairly cool temperatures, so is indispensable to keep them above 8-12°C at all times, severe damage or death occurring at temperatures that the great majority of cacti wouldn’t mind in the least and prefer more frequent water in winter than other cacti, say once a month. (but hardy to 4 C ° C for short periods). However warmth throughout the year will increase the grower's success (minimum 12° to 20° C during rest season). - Mealy bugs: Mealy bugs occasionally they develop aerial into the new growth among the wool with disfiguring results, but the worst types develop underground on the roots and are invisible except by their effects. Propagation: Exclusively by Seeds. Sow in February-march in a light, sandy, porous soil. Cover germinating tray with glass to prevent seed from drying out. Germination is most successful at a temperature of 18 to 22° C. It can also be propagated by lateral offshoots (if available), grafting is not necessary.